This month we would like to mention a little about the best produce scales for farmers market use. These legal for trade produce scales are very important for sellers at the farmers market because the seller is using the scale weight to charge the customer a price per pound. Years ago, most of these price computing scales either had no battery or only used D size batteries. So, it could be inconvenient or expensive to keep those scales up and running on battery power. Fortunately, most of today’s top legal for trade scales include a built in rechargeable battery that can be used over and over. And, once it’s been used up, you can buy a new battery and keep right on going. We’ve written about this subject before over the years. And truthfully each year provides us with the opportunity to fine tune our suggestions for the best produce scales. And, we do that. We look at sales, customer reviews, customer comments, and service history. 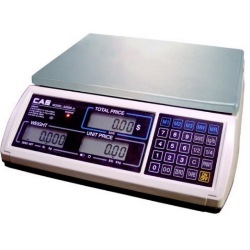 This year our top choice is the CAS S2000 Junior price computing scale. The S2000 JR has been very reliable over the years. We have sold many of these scales and they very rarely have any major issues. Sure you may need a new keypad, AC Adapter or battery…. but beyond that we have not seen very many major issues with this scale. That is our experience, others may disagree. As for functionality, what we are referring to with this is really two things. First, the S2000 JR has the ability to easily connect a label printer. The printer of choice used to be the DLP-50 but now it appears to be the DT2X due to DLP-50 stock issues. Either way, that is a nice feature to have a printer that can connect fairly easy and print out basic labels. Secondly, the S2000 JR has the ability to weigh in ounces. This is something that many of our customers want. The last thing we mentioned about the S2000 Jr was value. This scale has dual range capacity which is almost like having two scales built into one. The scale has battery power along with AC power with the included charger / AC adapter. The scale is a great value at the current price. So there you have it, the S2000 Jr is our top pick this year when we look for the best produce scales for farmers market use. What is the best legal for trade portable scale for a produce stand with no power? One answer would be the CAS 2000 JR which includes a rechargeable battery. The other answer that some folks might prefer is the Chatillon legal for trade hanging dial scales. Hope this months article helps you out.